For a week now rumors have been rampant that Microsoft would release a “Switch to Windows Phone” app to Android users. The day has arrived and the app has landed in the Google Play store. The free app is available today and attempts to make a switch from the Google mobile platform to that of Microsoft an easier transition. 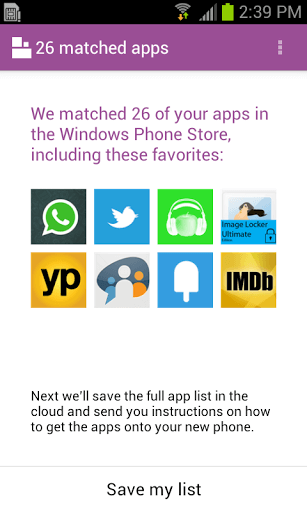 “Use Switch to Windows Phone to see how many of your Android apps are available on Windows Phone. Just run Switch to Windows Phone on your Android, and this app will check to see if your installed apps are available in the Windows Phone Store” the app tells us. Switch to Windows Phone will then proceed to save to the cloud the app list it puts together and keep it ready for you when you pick up that Nokia Lumia or HTC 8X handset. Needless to say, Microsoft is being attacked by Android phone fans — the app already has a two star rating, with only 22 users giving it five stars, while 213 customers handed it a one star review. Still, you have to hand it to Microsoft for trying. Perhaps the company may even land a few new customers who may have already been on the fence about switching.